Bale Mountains National Park is a magnificient high altitude plateau with numerous dramatic volcanic plugs, seasonal tiny alpine lakes and cascading mountain streams. The area of the park is 2400 km2 with an altitude ranging from 1500m-4377m a.s.l. It is the largest Afro Alpine habitat park in Africa. There are about 46 species of mammals and 200 species of birds in the park. Bale is the best park for trekking, walking, and camping to view the endemic life. The head quarter is located at Dinsho where endemic mammals like Mt. Nyala and Menelik’s Bushbuck are seen. Warthog and Bohor reedbuck can also be seen here. The Afro-montane forest in Dinsho includes Juniper procera, Hagenia abyssinica (endemic plant), and Rosa abyssinica (end.). Sannate – is a high plateau souring up to 4000m on top of which the second highest peak in Ethiopia, Mt. Tullu Demtu (4377m), among, many is found. The seasonal alpine lakes, some rare birds, and above all, the Ethiopian wolf are spotted here. The wattled cranes, the rare red-shelled duck, are common here. One of the endemic plants, Giant lobelia, is also found on this plateau. Harenna forest – it surrounds the southern end of Sannate plateau. 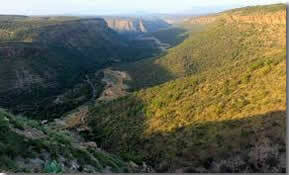 It is one of the densest forests in Ethiopia. Mammals like Bush pig, African hunting dog, Giant forest dog, spotted hyena, Lion, Leopards, Colobus monkey, etc. are found in Harenna. There are also many species of birds and butterflies. In general Bale Mountains National Park is the home of endemism.